In this month’s Global London special we track the fortunes of the leading international advisers in the City. But are foreign players making progress? 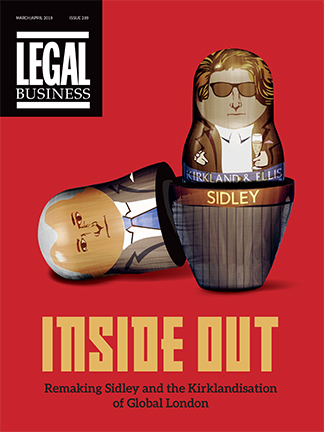 Tony Angel and the cute teddy bear next to him greeted me as I found my new desk – a Legal Business cover from 2003 and a personal favourite, a brilliant dissection of Linklaters’ painful reinvention as metric-driven world-beater. I soon dug out other classics, including the 2009 Icarus-themed investigation into pre-collapse Halliwells and the crumpled Hammonds cigarette packet illustrating a 2005 piece on the national player’s strained finances. Panel reviews are a cut-throat business these days, even for firms like SNR Denton and Slaughter and May. The duo was recently evicted from the Land Securities legal panel after a year-long review by group general counsel and company secretary Adrian de Souza. It seems not even the big hitters are immune to facing the chop. Two features this month focus on firms that have dusted themselves down and have come back fighting. For markedly different reasons, both Clifford Chance and Bristows have returned from positions of perceived weakness to enjoy something of a renaissance post-economic crisis. A lot of firms talk a lot of rubbish about cohesive, collegiate partnerships these days but the competitive spirit within law firms is alive and well. Politicking, back-stabbing and underhand, cut-throat tactics are all employed to help everyone ascend the greasy pole. But there is another way. Snubbing the hard-nosed approach can work: just look at Bristows.